One of the best things about representing the Northern Territory at the British Birdfair in Rutland, UK is seeing all the familiar faces of past and upcoming guests and those who just get really excited when chatting about three of our favorite past times: bird watching, photography and travel (in no particular order). 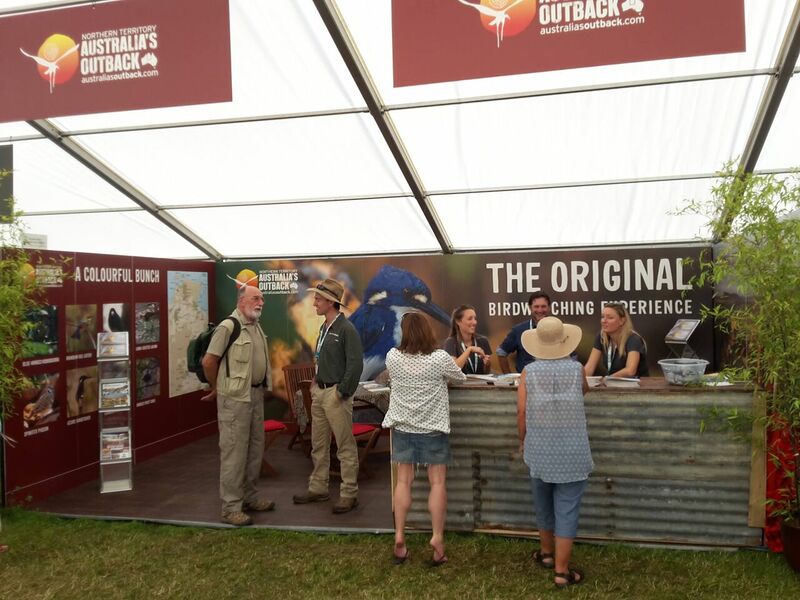 We are supported by the Tourism NT team alongside fellow Northern Territory bird guides (Mick Jerram and Mark Carter) to represent our beautiful backyard on the Outback Australia’s Northern Territory stand in Marquee 3, Stand 3-4. Luke has lectured for the last three years in Lecture Marquee 2. Luke takes Birdfair enthusiast on a virtual tour to experience some of the natural wonders of the the Northern Territory. NT Bird Specialists was sponsored by Tourism NT to represent Northern Territory bird watching tourism in Sydney at the Australasian Bird Fair. “Described as the birdwatcher’s Glastonbury, the British Birdwatching Fair is jointly organised by the Leicestershire & Rutland Wildlife Trust and the RSPB. Birdfair encompasses the whole spectrum of the birdwatching industry whilst at the same time supporting global bird conservation. This is the event of the year if you’re into birds and wildlife and can visit the UK in August. There are hundreds of stands selling the latest products for wildlife enthusiasts. You’ll find everything, from scopes to sculptures, binoculars to bird food, eGuides to eco-holidays! Check out the NT Tourism stand to find bird watching holidays to the Northern Territory. Ask about the NT Bird Specialists tour of the Top End. This website is your complete guide to who is exhibiting and appearing at Birdfair. The world’s largest wildlife event, the Birdfair, has celebrated its quarter century by raising a record amount for conservation. Birdfair is held annually at Rutland Water for three days every August. For 25 years, the bird fair has funded and helped promote the Birdlife Partnership’s work around the world. There is no doubt that the event has become a major force for conservation”. The British Birdwatching Fair has come a long way from its humble beginnings in 1989. The idea evolved from a local event held in 1987 at Rutland Water Nature Reserve called “The Wildfowl Bonanza”. The Fair takes place on the nature reserve at Rutland Water which itself is a huge water storage reservoir owned by Anglian Water. The nature reserve is a RAMSAR and Special Protection Area and is managed by The Leicestershire and Rutland Wildlife Trust. NT Tourism has been operating a stand at the Bird Fair since 2008 and friendly staff and operators will provide great information to prospective Northern Territory birdwatchers. The aim of the Fair was to get birdwatchers together to celebrate birds, to develop a commercial fair for the birdwatching industry and to support international conservation projects. In excess of 25,000 visitors now attend the Fair annually and over 300 exhibitors display their products, with BirdLife International and its partners receiving the profits for conservation projects. Birdfair attracts exhibitors from all over the world promoting businesses as diverse as eco-tourism, optical equipment, old/new wildlife books and bird feeding products.